Yesterday, I did a profile (https://bygl.osu.edu/node/924) of the lovely shining or winged sumac (Rhus copallinum) that include the following statement: “The wings on the stems are cool. BYGL-alert readers were true to their calling. Alarum Alarum, Alert Alert. Within minutes, John Swintosky of Louisville and Fred Robinson of northeast Ohionproperly and politely responded with corrections. Excellent. As Alerters noted, I was wrong. Indeed it is not the stems that are winged. It is the rachis. There are a number of definitions of rachis, including the “spinal column” and the “main stem of an elongated inflorescence, as in a grass” (The Free Dictionary). 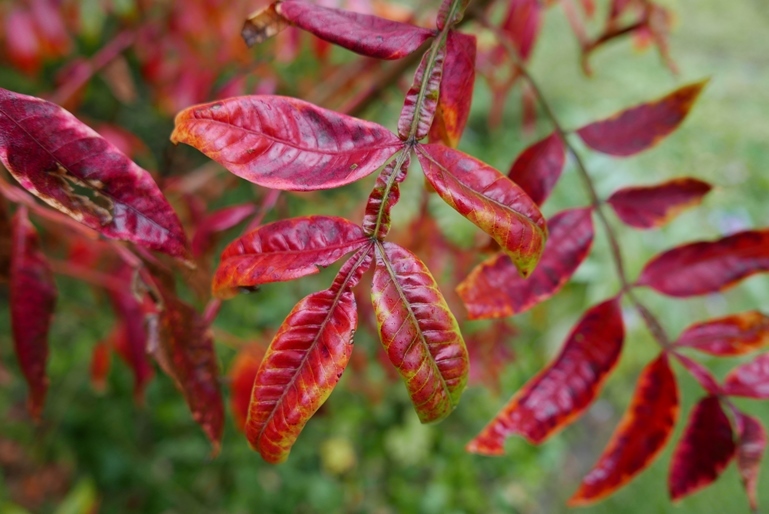 But one of the top definitions of the term is “The main axis of a pinnately compound leaf.” And such is so, the leaves of shining or winged sumac are indeed compound, and the “wing” in question is a rachis, not a stem. I shall find some way to reward John and Fred in the future. Bonus: Two additional photos of a rachis – from the compound leaves of ash. Compound because the leaf is coming off of an axillary bud, with “leaflets” having no such axillary buds. Added bonus, one of the photos includes ash anthracnose disease, which brings out my phytopathological passion. I need to express this while I can, as ashes begin to fade from our everyday memories.